Cost to install a water heater. Prices for replacement, installation. Average cost of water heater installation vary from $270 for 18 kW tankless electric unit with 2.3 GPM (gallons per minute) flow rate to $3,150 + for 80 gallons separated tank high pressure solar water heating system. 1 Prices in the chart are approximate charges per unit to install a new water heater. Due to huge variety of products even in the same category cost for installation may vary as much as 100% both ways. There are numerous of circumstances which will have direct impact on the cost of installation and the prices to install a new water heater will be adequately prorated based on work intricacy and time spent. Expenses for all necessary materials as well as purchasing the actual water heater unit will be added separately to the total cost of water heater installation. 2 Average cost of installation estimated for basic work complexity excluding any materials expenses. Additional fees will be charged for installing a water or gas pipes. 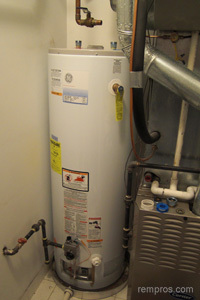 Cost of labor will increase if electrical outlets, circuit breakers or new power lines to a water heater have to be installed prior to connecting a new unit. 3 Difference in cost indicates average savings or how much more you should expect to pay for different types of water heaters installation compare to installing a storage tank gas water heater. For the water heater replacement an installer will charge an additional fee which normally increase the total cost of labor at 20% - 35%. Very often flat rate charge of $70 - $150 will be added to take out and haul away an old unit. What are additional costs for water heater replacement? If you are planning on replacement approximately the same size and most of all type of a water heater the additional cost will be minimal. In case you want to replace your old unit with a completely different type and source of energy water heating system the cost will be much higher. Additional time spent to fit a new unit into place and extra work to connect the new unit properly will lead to significant price increase. Will the installation of a solar water heater be paid off? The straight answer is yes – your energy bill will decrease, but bigger initial investment has to be made. It is a very controversial question in term of savings. Let’s say you spent $5,000 more on the installation of a new solar water heater system in comparison with traditional one, and saving every month $50 on a bill means it will takes 8 years to start getting your money back. It just an example, but in general you have to wait a long time to start actually saving. Why a tankless water heater is cheaper to install than storage tank water heater? Tankless water heaters are smaller in sizes and are easier to install. Electric tankless water heater is one of the cheapest options when it comes to the cost of installation due to simplicity of installation and smaller dimensions. How much I should expect to pay for materials while replacing a water heater? Cost of materials (not including the water heater unit) will vary from a hundred to a couple thousands and basically will depend on the type of existing and new water heater. If you are changing the type and source of energy for a new unit there are a lot of new parts have to be purchased what will increase the materials cost. The cost of actual water heater will vary from a few hundred on the low end to a few thousand dollars. Cheapest 13 kW electric tankless water heater which might work well for one story 1 ½ bathroom 800 – 900 ft2 house can be bought at local home improvement retailor for $255 - $310. At the same time a hybrid – electric water heating system for a 4 bathroom 3,200 ft2 two story home might cost $4,550 - $6,050. How much did you pay for water heater installation?